Electronic Arts has acknowledged that Medal of Honor: Warfighter sales are lower than expected. Analyst Doug Creutz said last week that Medal of Honor: Warfighter, EA's new modern combat FPS, was "likely to be a major disappointment," and it looks like he wasn't too far wrong. In a conference call with investors earlier today, CEO John Riccitiello said EA's third-quarter results are likely to be "soft," due primarily to weaker-than-expected sales of Warfighter. Specific numbers weren't revealed, but EA has reduced its full-year financial outlook by $50 million in response. EA actually managed to post a slight year-over-year revenue gain for its second fiscal quarter, earning $1.08 billion, up from $1.034 over the same quarter in the previous year. "We are managing the ups and downs. Our Q1 and Q2 were better than expected," Riccitello said. "Our Q3 appears soft, due mostly to Medal of Honor." 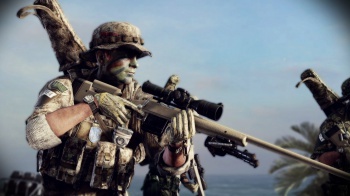 The company noted that Warfighter actually managed to hit the top of the U.K. sales charts in its first week of release, although EA Labels President Frank Gibeau admitted that EA is "not pleased with the situation." He said that internal testing and mock reviews indicated that Warfighter is better than the ugly critical reception it has received thus far but added, "There are people out there who just don't like the game." Our own MiracleOfSound awarded Medal of Honor: Warfighter a 2.5/5 score in the official Escapist review, calling it "marred by a myriad of bugs and cliches." It currently has a cross-platform Metacritic review score of 54.